The leading event in South-east Asia for the graphene industry. 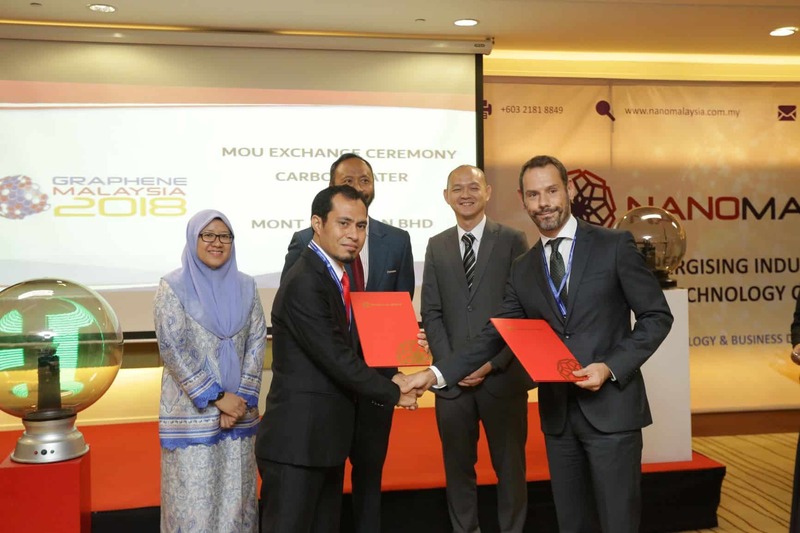 Graphene Malaysia was held on 29 and 30 October, 2018 in Kuala Lumpur attracting around twenty speakers and several hundred visitors… Carbon Waters was invited to sign a partnership with the company, Monte Aero, as part of the NanoMalaysia programmes. The signing of the contract gave rise to an official ceremony (photo) in the presence of the Ministers of Technology and International Trade, the Chairman of NanoMalaysia, the Director of Monte Aero, as well as Alban Chesneau. “We were spotted at the JEC World event (the leading international composites show) which was held in last March in Paris. Carbon Waters achieved great visibility by being selected as one of the 10 companies to watch in the composites industry. Representatives from Monte Aero approached me and a collaboration began to develop”. The commercial partnership between Monte Aero and Carbon Waters did not come about by chance. Malaysia is a country that produces palm oil and rubber to which graphene provides significant added value. Carbon Waters is going to work on applications related to rubber for two companies but also related to oil exploitation for the Petronas University of Technology. “We’re going to sell them our graphene dispersions, announced Alban Chesneau, initially on a relatively small scale. This is just the beginning but will serve as proof of concept. We have very good potential for development in Malaysia in the coming years, which constitutes an excellent opportunity for Asia in general”.